PARLIAMENT HILL—Parliament hadn’t even resumed before the Conservatives and NDP found themselves at loggerheads with intractable differences. While Parliament officially restarted with the Governor General’s speech from the throne on Wednesday, a motion filed by the government the day before had already infuriated the NDP. The motion would reinstate the legislative agenda from the previous session of Parliament. Normally when Parliament is prorogued, as it was last June, bills not yet passed die on the order paper. While the NDP objects to the idea of resuming much of that legislation, the party’s House Leader Nathan Cullen was irate that the government bundled the resurrection motion with other measures important to the NDP, including an investigation into missing and murdered aboriginal women. Cullen said the bundled motion prevented an honest vote in the House of Commons—MPs could not vote for or against specific measures. “Tying missing and murdered aboriginal women to some other motion to give them a carte blanche in the House to introduce every other old bill that they want to introduce is deplorable, it’s disgusting,” said Cullen. While not common, a motion to resurrect bills on the order paper before prorogation has been done many times before, particularly in regards to private members bills. However, it is unusual, possibly unprecedented, to bundle other items with that effort. Government House Leader Peter Van Loan said the motion is in the interest of all MPs, independent or otherwise, who wish to see their various bills resume without starting from scratch. The NDP’s first order of business when the House of Commons sat briefly following the throne speech was an attempt to break up the motion. The debate was ended quickly after the House adjourned for the day. NDP leader Thomas Mulcair said earlier Wednesday that the NDP would also file a motion challenging Prime Minister Stephen Harper’s accuracy about who knew what and when they knew it regarding the cheque his former Chief of Staff Nigel Wright gave to former Conservative Senator Mike Duffy (now an independent). The NDP want to use that point of privilege to attempt to sully the glow the government gained with the pomp and ceremony surrounding its Speech from the Throne while simultaneously reminding Canadians about the ongoing scandals surrounding Senate expenses. 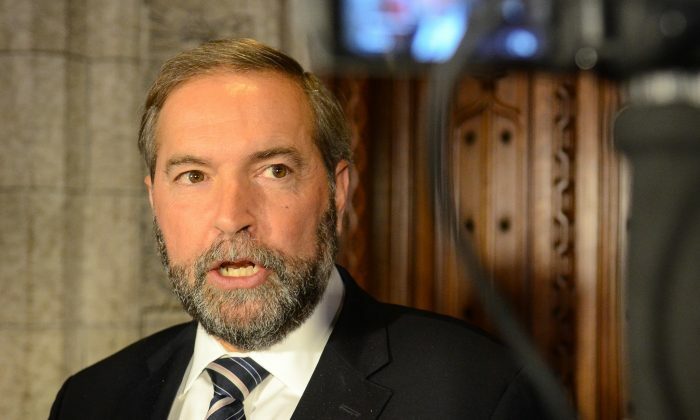 Mulcair said the government’s proroguing of Parliament and Speech from the Throne were efforts to avoid the Senate scandal. “I notice that [Harper’s] attempt to change the channel was occurring at the scene of the crime in the Senate,” said Mulcair. The throne speech itself offered few major surprises aside from a pledge to legislate balanced budgets. That law would force the government to balance the books during “normal economic times” and be held to concrete timelines to return to balanced budgets in the event of an economic crisis. The weight of the legislation will lie in how specifically “normal economic times” and “economic crisis” are defined. Other notable measures in the throne speech were leaked previously, including items aimed at consumers, some of which were previously proposed by the NDP. The government had signalled that consumer-centred policies would feature prominently in the current sitting of Parliament, but some that were floated, including an air passenger bill of rights, never materialized. Mulcair noted that many of those policies were the same or similar as NDP consumer policies, such as bills to prohibit pay-to-pay fees some companies charge customers who want a paper bill. Other government measures seemed aimed at addressing the same issues as NDP proposals. They include a plan to force disclosure over the cost of different payment methods, reduce cell phone roaming fees, and prohibit cable television providers from forcing Canadians to buy extra channels by bundling channels together. As expected, the economy, jobs, trade and natural resource development remained the top priorities and took prime spots in the speech. In a surprising coincidence—or what Mulcair alleges is an intentional effort to avoid the House of Commons—Harper will leave for Brussels, Belguim, tomorrow to wrap up negotiations on the Comprehensive Economic and Trade Agreement free trade agreement with the European Union. The wide-reaching deal had been stalled in part over Canada’s supply management policies, but seems to be moving ahead after Canada made concessions that will double the amount of imported European cheeses. If the deal is concluded, it will be—by far—the most significant trade deal the Conservatives have closed and fulfill a major platform promise.